For his part, Rick Neuheisel, who at 34 was the second youngest head coach in Division 1-A college football (Louisville’s Ron Cooper was all of four days younger), entered Fall Camp, 1995, with optimism and confidence. The safe road would have been to maintain as much continuity in the program as possible. After all, the players in Boulder were talented; the program in high gear. There was no reason to rock the boat. But the status quo was not Neuheisel. During freshman practices, Neuheisel demonstrated his willingness to be his own man. He took the incoming class inner-tubing in Boulder Creek. He canceled practices. He had the Boulder police called to his home when a pre-season party for staff went too long and became too loud. Camp Rick was not a McCartney camp (by contrast, when Nebraska head coach Tom Osborne stepped down after the 1997 season, all the pre-season articles concerning the upcoming 1998 campaign remarked on the lack of change by incoming head coach Frank Solich). The players seemed to respond well to the changes. On September 2, 1995, some of the questions about Rick Neuheisel, head coach, would begin to be answered. Colorado, which opened the season as the 14th-ranked team in the nation, would go on the road to face the Wisconsin Badgers. Wisconsin players had plenty to prove themselves. The Badgers had been embarrassed by Colorado, 55-17, in Boulder in 1994, and wanted to let their Big 10 brethren know that they would be a force to reckon with in 1995. What better way to accomplish this by defeating the Buffs in a night game regionally televised by ABC? The Badgers came into the season opener ranked 21st in the nation. 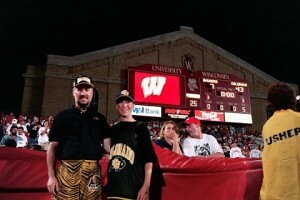 Over 79,000 fanatical Badger fans poured into Camp Randall Stadium to witness the debut of Colorado head coach Rick Neuheisel. Although schedules are made years in advance, commentators could not help but note that Neuheisel would coach his first game as head coach of the Colorado Buffaloes in his hometown of Madison, Wisconsin. In the kickoff to the “Neu Era” in Colorado football, the Buffs served notice to the college football world that Colorado could not be taken lightly. Despite losing 10 starters to the NFL, the Buffs dominated the Badgers throughout, taking a 26-7 halftime lead before cruising to a 43-7 romp. Not a bad entrance, Rick. Quarterback Koy Detmer showed there was reason to believe he would ably succeed Kordell Stewart at the helm, completing 17-of-24 passes for 267 yards and three touchdowns. Rae Carruth hauled in only four of Detmer’s passes, but covered 100 yards in doing so, converting half of his receptions into two first-half scores. Detmer, for his part, credited the offensive line for his success. “I didn’t have much pressure on me all night”, said the Buffs’ quarterback. “The offensive line did a great job of keeping those guys out, picking up twists and stunts all night.” Three Buff rushers, dubbed by some in the media as the “Thoroughbred Trio”, combined for 157 yards and one touchdown on 32 carries. Sharing the offensive wealth were sophomore Herchell Troutman (15 carries for 76 yards), junior Marlon Barnes (10-for-48 yards, one touchdown), and junior Lendon Henry (7-33). On defense, the questions concerning a shaky secondary were also answered. Wisconsin quarterback Darrell Bevell, victimized for four first half interceptions by the Buffs in the 1994 game, fared little better in 1995. Bevell was picked off only once by the Buffs, but could muster only 175 total yards passing, and was sacked five times. Leading the defensive charge for the Buffs was safety Steve Rosga, who not only sacked Bevell twice, but also stole the ball out of tailback Carl McCullogh’s hands in the fourth quarter. After swiping the ball from his former high school teammate, Rosga rumbled 75 yards for the game’s final score. – For his 11 tackle, interception, and fumble recovery returned for a touchdown effort, Steve Rosga was named the Big Eight Defensive Player of the Week. – Rosga’s 75-yard fumble return for a touchdown was the first score by the Buffs off of a fumble recovery in 11 seasons. This post, about the Wisconsin game, from the 1995 Season, is filed under Game.